Some weeks ago, a friend of mine sent me a message letting me know that historian and author Michael Wallis, arguably most known for his 1990 book about Route 66, would be speaking in Oklahoma City on July 30th. That book is widely recognized as a major contributor to the current revitalization of the Mother Road. He is not only a subject matter expert when it comes to Route 66, but he has written over a dozen books on various topics couched in the American West. He was even sought out by Pixar Studios as a consultant for their 2006 film, ‘Cars’ and ended up voicing the sheriff in the movie. He’s a legend in the roadie community, so I jumped at the chance to hear him speak in person. I built an entire day out of the journey and was able to bring Samantha with me, too! Ever since I started my current work schedule (2:00 to 11:00 PM) I have had much less time to spend with my soon-to-be wife. Most days, I crawl into bed after she’s already gone to sleep; the next morning, she leaves early as I groggily wish her a good day at the office. I work rotating weekends and she works many local events, so getting to spend an entire day together is a treat in and of itself. We hit the road yesterday with a collection of things to see and do, ending with Michael Wallis’ talk at the Gaylord-Pickens Museum. When we entered Oklahoma City limits, our first destination wasn’t on Route 66 or at some random neon sign somewhere; instead, I took us to a secret place. There’s a specific tree in a field SOMEWHERE in Oklahoma City that local Instagram users have taken pictures of and tagged with #okctreecult, or something similar. My friend Maggie even discovered it during one of her summer work assignments and snapped a few pictures herself. I was determined to find it and see it with my own eyes, but part of the tree cult is that nobody will tell you where it actually is. You have to be taken there by someone who has been there before or come across it organically. Since I’m in Tulsa, I couldn’t drive around and hope to discover it; instead, I used Google Maps for untold hours to look for probable locations and crossed my fingers that Street View would be there when I needed it. 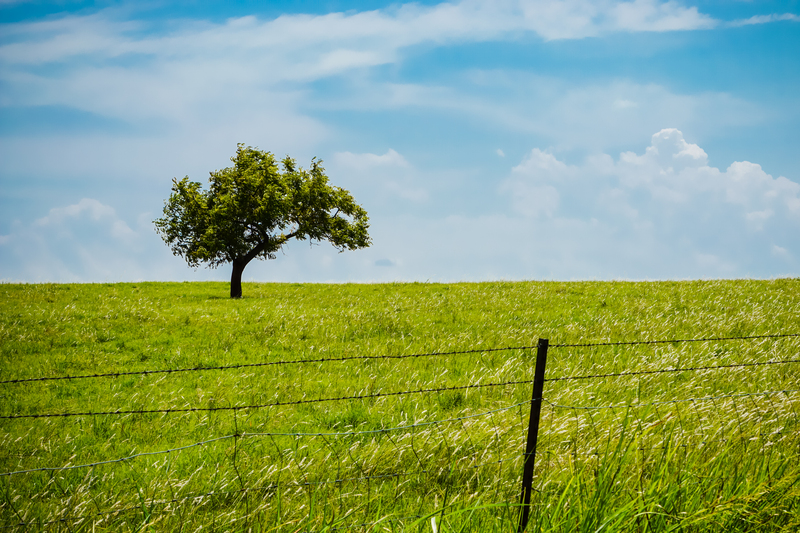 Thankfully, I was able to locate it…and that’s how I wound up standing in the tall grass, taking pictures of an otherwise lonely tree that most folks bypassed without a second thought. I’m now part of the club! Evidently, the owners had taken the week off for their summer vacation. A local had pulled up at the same time I did and made a simultaneous disappointing discovery. I seriously almost cried. Ironic that it was the LACK of onions that caused this reaction. Samantha, bless her, soothed my burger despondency with an alternative: Irma’s Burger Shack back in OKC. She ate there years ago, but I’d never been. El Reno wasn’t a total loss, however; I stopped and took a few photos of a giant mural, called Guardian of the Mother Road. The artist has work in Bristow and Tulsa, too, all along Route 66. Beautiful stuff! Back we went – and the burger was good. Irma’s uses beef from Oklahoma-raised all-natural cattle, and the char on the burger was perfect. They even had a nice neon sign, even though the business has only been around since 2003. 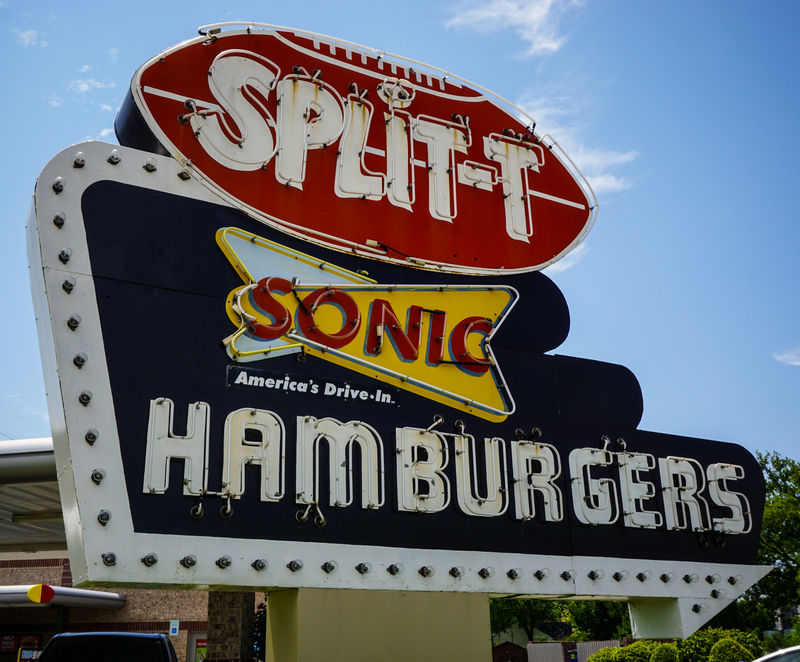 Just down the street was another old sign that was on my list: the Split-T Hamburgers sign. Split-T was an old burger joint that was in business from 1953 to 2000. When it was demolished, a Sonic Drive-In was built and they saved the sign! Great to see an Oklahoma-based business pay attention to the heritage of the site. After lunch, we went shopping. After a stop at the Blue Seven shop (fantastic boutique for local apparel and gifts) we drove to the 16th Street Plaza District. We’d been to the area several times in the last year, but it was ALWAYS when the shops were closed. Thankfully, mid-day Thursday is a great time to visit! There are many local-owned shops with a variety in goods, from clothing to furniture to foodstuffs. In one of them, a clothing store called Out on a Limb, Sam had a great conversation with the owner who is ALSO getting married on October 10th! How cool is that! We capped off our retail runaround with ice cream at Roxy’s. Seriously, if you’re ever in OKC in a bad mood, stop here. The lady at the counter’s spirits matched the bright and cheerful decor; I don’t think I’ve ever had a more enjoyable serving of chocolate ice cream. It was getting close to lecture time after that, and thankfully the museum was only a mile or so from the Plaza District. The Gaylord-Pickens Oklahoma Heritage Museum is a grand building, built in 1927, and houses the Oklahoma Hall of Fame. Michael Wallis’ speech was in conjunction with a Route 66 exhibit at the museum, which we walked through before the event started. It’s a well designed exhibit, speaking to the overall history of the Route through all eight states. There’s a neon sign, an old gas pump, and even a little facsimile drive-in display. Of particular interest to me was the long timeline of Route 66 happenings, which I spent a few minutes poring over. There was also a collection of brilliant watercolor paintings by Oklahoma artist Caryl Morgan. It’s well worth the stop if you’re in OKC before it finishes on August 29th. Mr. Wallis arrived at about 5:40 PM and began signing books. I was a little nervous; yes, he’s just a man, but he’s THE man when it comes to Route 66 national recognition. When I went up to his table, I introduced myself with all the confidence I had in me. “Your name sounds familiar,” he said with his distinctive voice. My heart leapt. I told him that we both had work on display at the Sand Springs Museum, and he nodded in recognition. My false confidence was replaced with true pride. We talked about some other Route 66 things, but the details are already lost in my brain. I didn’t take up much of his time, as the line was forming behind me, but Samantha and I took a few moments to talk to his wife, Suzanne. She’s seriously one of the sweetest people I’ve ever met. She is also an accomplished photographer and artist in her own right. She welcomed us both to the extended Route 66 family. We took our seats in the main room and remarked at the audience. There were quite a few people in attendance, but we were the youngest by about two decades. Most of the attendees looked to be 65+ in age. 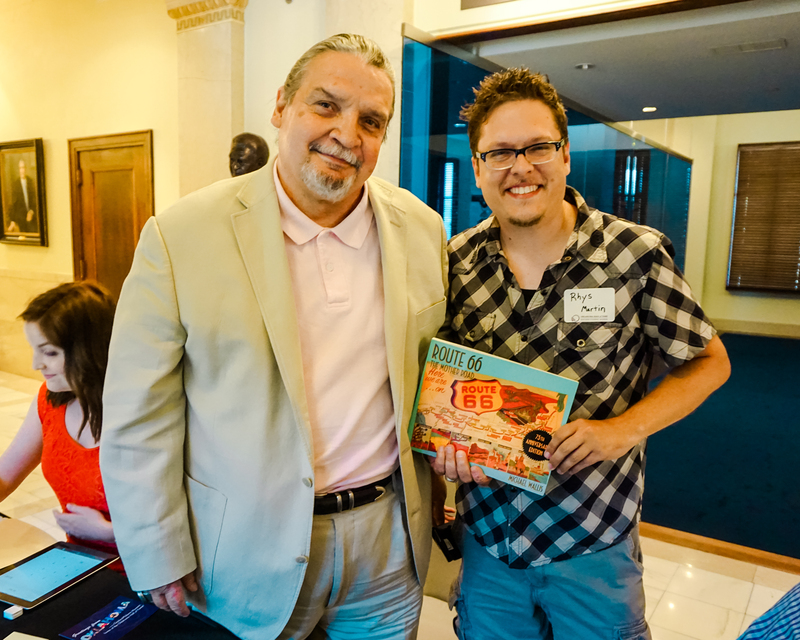 In all of the gatherings I’ve had with Route 66 roadies, people have really focused on my age and how Route culture needs to start reaching younger people. That message had never been so clear than it was in that room. Michael’s speech was amazing; he is a very gifted public speaker. He talked about his childhood in St. Louis, just off the Route, and the ritual of the 1950’s family road trip. He talked about his time in Tulsa, his home since 1980. He told stories about touring the road with the Pixar crew and groups of people from the Smithsonian. He spoke of the importance of the Route throughout its life, from the early automobile days to the Dust Bowl refugees to the G.I.’s training for World War II to vacationing families in the road’s heyday. But, perhaps most importantly, he talked about how the road is STILL THERE, and how the people on Route 66 were the most important ingredient. They still live and work along the old highway; the roadside attractions still bring tens of thousands of tourists annually, and the diners still serve classic roadside fare. It was a bright message of hope for the future of the Route. We didn’t get back home until about 11:00 PM. 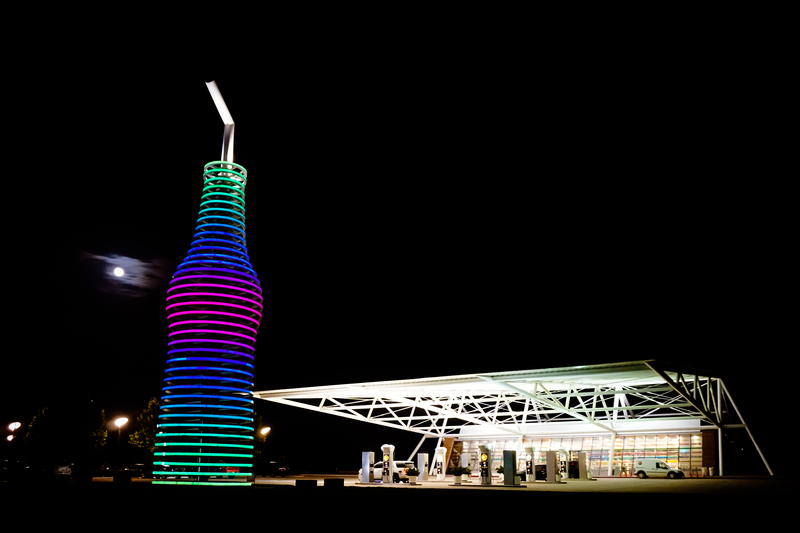 We stopped for a few minutes at Pops in Arcadia (I hadn’t ever taken photos of their giant pop bottle lit up at night) and split the journey between old Route 66 and I-44. We were both worn out from the day, but it was worth it. The trip was a resounding success. I’m so glad you got to attend his talk and see the exhibit. I have it on my list of things to do before the exhibit is over. Sounds like a perfect day. Thanks for sharing. Rhys, you are becoming the next Rt 66 King yourself! Keep up the good work! So happy to help!